After reading an interview with the author, I simply had to buy this book. The plot seemed too good to miss out on, and being set in a small village in the the south of Italy, at the turn of the last century, it sounded like my sort of thing. The story is about Concetta, a fifteen year old peasant girl who wakes from a coma after an earthquake, finding herself pregnant and with no memory of how she became that way. Worried about the scandal it would cause, not to mention ruining the chance of marriage for her two sisters, Concetta is quickly married to a family friend to settle an age old debt. Through the rest of the book, we follow Concetta through her new routines as she tries to get to grips with her new life. The book is nicely written, with lots of details of the daily life for the farmers in this small Italian village. We learn about the clothes they wear, the food they eat and the superstitions that rule their lives. I found all these details very interesting, and I’m sure very accurate. What fascinated me the most, were the female characters in the story. Concetta at only fifteen, has had to grow up and become a responsible wife when she is still really only a child. Where many other girls would rebel or complain about how unfair life is, Concetta gets on with things and tries to make the best out of a bad situation. She has a good role model in her mother who is out working in any weather and under any circumstances. Concetta and her mother are strong female characters, but different from many other heroines. They are not rebellious or daring, but in their own way they are very courageous. They live a hard and demanding life and, being women, have a very restricted lifestyle, with the men controlling everything. For me, it is impossible to comprehend a life without my independence and with no freedom. Although the plot dips slightly in the middle, and I lost interest a bit in the long descriptions of the menial jobs that had to be done daily, the storyline did pick up again towards the end. There are some very gripping twists and can’t-put-the-book-down chapters and it is definitely worth sticking with it until the last word. 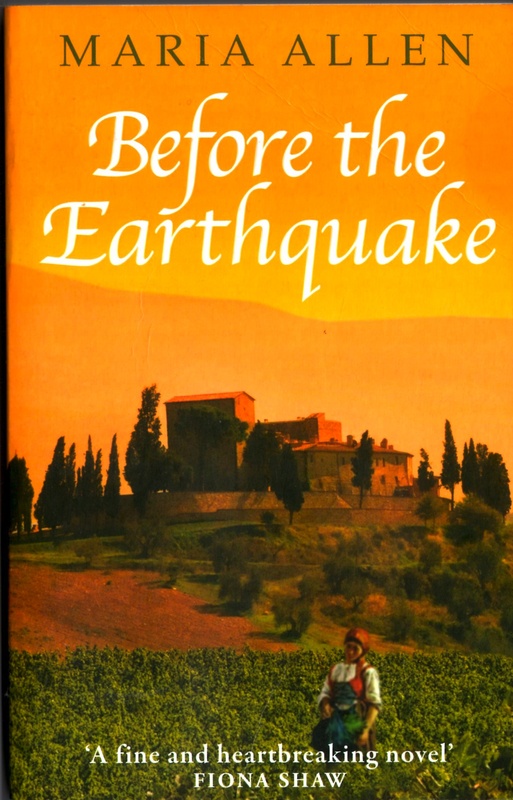 I had expected Before the Earthquake to have a lot more romance and passion, but was happily surprised by the fact that it was more realistic than that (even if the plot summary hints otherwise). I will be looking out for more by Maria Allen, being her debut novel, I will be interested to see what she will write about next!